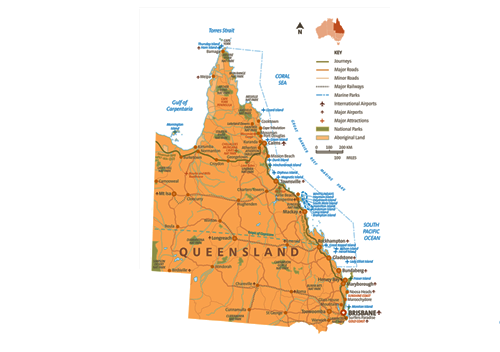 Queensland is twice the size of Texas. While travelers know it for the Great Barrier Reef and the temperate and tropical rainforests which hug the coast, the vast outback holds cattle stations and large mining operations. Most travelers visit Far North Queensland or the Southern area. Qantas started here as the Queensland and Northern Territory Aerial Services. This significant rainforest is one of just two places in the world where a tropical reef (The Great Barrier Reef) touches a tropical rainforest. There are plants here that grow nowhere else in the world – and new species are frequently discovered. To understand what you are seeing, we book your walk with a naturalist. In the dry season we usually have clients stay a night or two in the rainforest because much of the wildlife is nocturnal. The Great Barrier Reef is as long as California. It lies two hours off the coast, by boat. Since it is in the Tropic of Capricorn, it has better water clarity for diving and snorkeling in the dry season – the Aussie winter. There are many ways to experience the Reef, so we help you decide which works best for you. There are daytrips on large and small boats; small ship cruises; live-aboard dive and snorkel boats, and luxury resorts built on small islands which are part of the Reef itself. Most people reach the Reef from Far North Queensland (Cairns or Port Douglas). Sailors and other travelers prefer the southern Reef, departing from Airlie Beach throughout the Whitsunday Region of Islands. Worried about the quality of what you might see on the Reef? Over the years, damage has indeed occurred; however, the Reef is rejuvenating itself. Recent clients have thoroughly enjoyed both snorkeling and diving and said the colors of the coral are coming back strong. The video is an update from a reputable Dive Operator we use near Cairns about the situation. In the USA, the Great Dividing Range runs through the Rockies. In Australia, it hugs the coast. Rain that falls on the east side has a short journey to the ocean. Rain falling on the west flows into the outback, ending in trickles and salt lakes in the deserts. Just over the Great Dividing Range from Cairns is the Atherton Tablelands. Once tropical rainforest, the trees were cut down to plant sugar cane. Today is it a rich agricultural area, but some areas are being re-forested. In the Atherton Tablelands it is easier to see more birds, than in the dense rainforests to the northeast. Here you can view the elusive platypus and lots of interesting wildlife like the small tree kangaroo. Explore Lake Barrine, Lake Eacham, beautiful waterfalls and the immense the Curtain Fig Tree. Go birding and nocturnal possum-spotting with our terrific guide here. Further west into the outback, visit the Undara Volcanic National Park. Far North Queensland offers some of Australia’s best and most accessible Aboriginal experiences. For example, after walking in the rainforest with a naturalist, walk with an Aboriginal guide and learn how they used the rainforest for medicine and food for at least 30,000 years. Wade in the mangroves with an Aboriginal man and learn how to spear fish. Then walk across the street to his home, where he cooks up your catch while you enjoy homemade tea and damper bread. In Cooktown, listen to an elder tell his family’s story while you sit in the rock shelter where his grandfather was born. For clients with keen interest in Aboriginal rock art, we arrange a tour to the outstanding Quinkan sites, little known to most travelers. Brisbane is the capitol of the State of Queensland. It is one of Australia’s largest cities, and you can fly there non-stop from the USA. Sitting south of the tropics, it enjoys great weather most of the year. It has a lovely Botanical Garden, and a ferry ride on the Brisbane River is an enjoyable way to rest your legs! Just outside Brisbane is the Australia Zoo, founded by the late Steve Irwin. Beaches: The Gold Coast, the Sunshine Coast, and the funky fun Byron Bay. Tangalooma Island: For sandboarding and feeding the wild dolphins. Fraser Island: A large sand island – is one of Australia’s 19 UNESCO World Heritage sites. Temperate Rainforests: Where you can see birds and wildlife that don’t live in Far North Queensland – like the koala. Let EDUT know your needs and we'll build your dream trip for you.